Eli Roth’s first foray into the realm of the family-friendly seems to have worked out well for all involved: It’s pretty good (“an ooky-spooky, creepy-crawly Halloween treat for horror-fans-in-training,” per our own Katie Rife), it made some real money, and Cate Blanchett got to wear some great sweaters. Not bad for a house that has a clock in its walls, which you’d think would be a real turnoff for prospective tenants. The Amblin Entertainment film picked up $26.8 million in its first weekend, a lone bright spot in slow weekend for theaters. 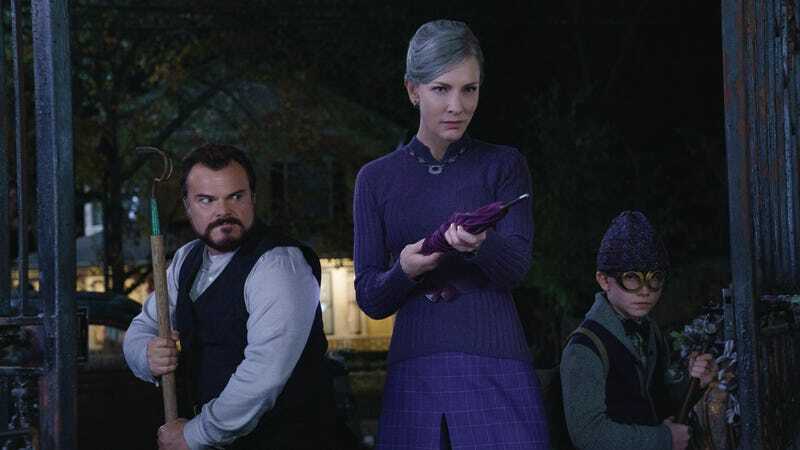 Cate Blanchett, Jack Black, and adorable moppet Owen Vaccaro’s film opened ahead of another intro-to-horror hit, 2015's Goosebumps, which also starred Black; that one racked up $23.6 million in its opening weekend on its way to an $80 million total. With Halloween looming next month, it’s possible, if not likely, that the spoo-ooooo-ky House will match or best that figure before its time runs out. Paul Feig’s A Simple Favor also made a strong showing, seeing only a 35 percent drop in its take, good for $10.5 million and second place, while the fifth-place Crazy Rich Asians took in $6.5 million in its sixth week, bringing its total to just under $160 million. That makes it the seventh-biggest romantic comedy of all time. Between those two sit The Nun ($10.2 million) and last week’s number one film, The Predator, which took a 65 percent tumble to fourth place. Combined, it all adds up to the third worst weekend of the year, so that’s about it for good news. And hey, speaking of things that aren’t good, Life Itself also opened, landing outside the top 10 with a $2.1 million dollar total and a per-theater average of $807. As Box Office Mojo notes, that’s “the second worst opening weekend of all-time for a film debuting in over 2,500 locations.” Writer-director Dan Fogelman will have to content himself with having one of TV’s biggest shows, which returns this week. Both properties concern themselves with how we’re all really connected, deep down, despite the wildness, the chaos, the wonder, and the tragedy of life—so that $807 must mean something, right? Neon’s Assassination Nation fared even worse, with a $733 per-theater average—it made roughly $1 million in 1,403 theaters. Michael Moore’s Fahrenheit 11/9 fared somewhat better, with an $1,804 average from 1,719 locations. In contrast, IFC’s Tea With The Dames made $15,031 in exactly one theater. Such is the power of Maggie, Judi, Eileen, and Joan.